What is the MOST BEAUTIFUL?" Шта је најоштрија ствар на свету? Take some time and read those 3 questions again. What would you have answered? The SHARPEST thing is the world is the TRUTH. The STRONGEST thing in the world is LOVE. The MOST BEAUTIFUL thing in the world is LIBERTY! Најоштрије ствар на свету је Истина. Најјача ствар на свету је ЉУБАВ. НАЈЛЕПШУ ствар на свету је СЛОБОДЕ! "The song has kept us alive....."
is another Serbian fairy tale you may enjoy reading. It came from Andrew Lang's FAIRY BOOKS, from the oral tradition of the SERBS. This story was written down by A.H.Wratislaw in 1890, in his book entitled: Sixty Folk-Tales from Exclusively Slavonic Sources. How about THIS Serbian version of Cinderella? Only she's called Papalluga here! This is from the Serbian Folk-lore: Popular Tales selected and translated by Madame Csedomille Mijatovics. London, 1874. pp. 59-66. Woislav Petrovitch, in his book entitled Hero Tales and Legends of the Serbians, called her Pepelyouga. Great stories with the themes of "Good vs. Evil"
(Translated from Russian) by Milorad Pavich: The Western Slavs' Songs"
Lord have mercy over Serbia! "How long will you tolerate janissaries? is gathering a band of armed men......"
Pushin's painting is by Vasily Tropinin and found on Wikipedia. Pushkin was born June 6, 1799 in Moscow (Russian Empire), and died Feb. 10, 1837 at age 37 in St. Petersburg, Russian Empire. He came from generations of Russian nobility. 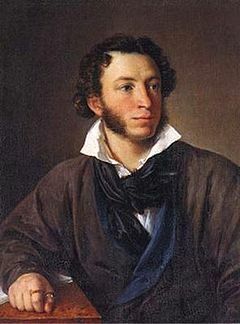 Pushkin is considered the founded of modern Russian literature. He published his first poem at age 15, widely recognized by the time of his graduation from the Imperial Lyceum in Tsarskoye Selo by the Establishment. His most famous play or drama was BORIS GODUNOV. "Though his life was brief, he left examples of nearly every literary genre of his day: lyric poetry, narrative poetry, the novel, the short story, the drama, the critical essay, and even the personal letter." Here's a line drawing that appeared in a large London, England newspaper called PUNCH or the London Charivari on October 27, 1915. 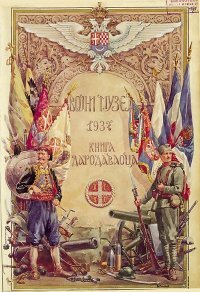 The title of the illustration is "HEROIC SERBIA," and was made by one of the WORLD'S most famous illustrators at that time, Bernard Partridge, Jr. Although surrounded on all sides by enemies, the heroic, courageous Serb fights on for his ideals. NOW, it's time for YOU to tell the story of Kosovo! Here are some things to help you. Remember when YOU make any kind of poster boards, take time to make them very neat. These boards weren't made in an hour or two. They took days! Look at how the pictures are mounted on construction paper to make them look better. Always allow yourselves lots of time to always do your best for ANY school projects! There is a round mirror by Czar Lazar. It's to show that Kosovo MIRRORS the spirit of the Serbian people. But it's also there for another reason. When YOU look into the mirror, you don't just see yourself. You see all the people who came before you, and all the people (YOUR descendants---YOUR children and grandchildren!) who are coming after you. So always do your best work! Be PROUD to tell Kosovo's story! I read something about the Serbs being like tillers of the soil everywhere: Confirmed individualists, natural born democrats, and with a fair-minded sense for individual's rights. Radaje Radovanovic, in a poem about the love of truth and freedom bred into every Serbian, wrote: "We are the sons of a country where the smallest child, as soon as he learns to walk, already knows how to die." Радаје Радовановић, у песми о љубави истине и слободе васпитан у сваком српском, написао: "Ми смо синови земље у којој најмање дете, чим сазна да хода, већ зна како да умре." "For the Honorable Cross and Golden Freedom....."
Even buttons can tell stories! This one shows that every Vidovdan Anniversary is important to the Serbs. Note the hero of the Battle of Kosovo, Milosh Obilich, painted in the middle, with the dates 1389-1937. It came from the Wilmerding parish, now Monroeville. This button was purchased at the auction of George Musulin, famous American Serb in the OSS who led Operation HALYARD, which rescued 500 American flyers from behind German-occupied lines in Yugoslavia. Be sure to read the new book THE FORGOTTEN 500 by Gregory Freeman that tells all about this rescue! "Better a grave than a Slave"
Hats or caps can tell stories too. Look at this Serbian Montenegrin's hat. It is said that the Serb wears his Kosovo history on his head! Wearing his Country's History on His Head. "The black border of his "kapa" stands for the terrible defeat of his Serbian ancestors by the Turks in 1389; the red is the Montenegrin blood spilled in combat; the gold braid on top, the number of centuries of warfare with the Turks." "When a 19th Century Turkish commander asked how far it was to Cetinje, then the capital in the mountains, a Montenegrin replied, "It depends. A friend can get there in six hours; a foe, maybe never!" Cards can tell stories too! There's the White Angel, Vuk Karadjic, King Peter I, the 2nd Serbian Uprising and so many more! Look at who the ACES are in this card deck! Sveti Sava, Karadjordje, Petar Njegos, Queen Milena, Jelena and more! The 3 of Hearts card shown here is of the 3 Holy Warriors. Do you know where the original fresco of the Holy Warriors is? It's absolutely breathtaking to see!. 3 Holy Warriors in Manasija Monastery, Despot Stefan Lazarevic, founder, completed from 1407-1418, near Despotovac, Serbia. The Holy Warriors are Areta, Naser and Nikita! See if you can find more information about who Stefan Lazarevic was, or learn more about some other frescos! If "evic or evich" or "ovic or ovich" means "son of," perhaps you have a clue! Here's a MAGNIFICENT piece of folk art done by an American Serbian pioneer from the Midwest: a wooden lamp that tells WWI history. It features Serbian soldiers all around the base. There is a carving of King Peter on his horse near the top. The Serbian crest with the 4 C's is at the very top of the lamp. This lamp is on display at the HEINZ History Museum in Pittsburgh, #423 in the Serbian Section of the Ethnic Room. Lamp that was donated to the Serb National Federation, now at the Heinz History Center in Pittsburgh.